Tritec previously manufactured the FASE II fusion splicer, but what is Fixed Alignment Splicing Equipment? In this section we look at the different types of fusion splicer, explaining the difference between 3-axis fusion splicers and fixed alignment splicing equipment. We describe the techniques used by Tritec in its FASE II splicer and compare the benefits of the different types of splicer. What types of fusion splicer are there? The fundamental processes involved during fusion splicing are accurate alignment of the fibres, and the precisely controlled high temperature arc (around 1200°C) created by a plasma between two electrodes to melt and fuse the fibres together as a joint. There are generally 2 types of fusion splicer based on the method of aligning the fibres – 3-axis fusion splicers, and Fixed alignment fusion splicers. What is 3-axis fusion splicing? In 3-axis (or cladding alignment) fusion splicing the fibres are viewed through a microscope and camera in two axes (x and y-axis). Precision translation stages accurately align the fibres in the z and x-axis, and the z and y-axis movements respectively prior to fusing. The fibres are brought in to alignment by motors or thumbwheel adjusters. The core alignment of the fibres is optimised automatically by one of two methods, depending on the design of the splicer. In a LLID (Local Light Injection and Detection) splicer, the fibres are bent through a sharp radius around special clamps, allowing light to be injected into one and extracted from the other. The system can then manipulate the x and y-axis positions until the light signal is at a maximum, indicating core alignment. An approximation of the splice loss across the joint can also be measured using the same system. In a PAS (Profile Aligning System) splicer, the boundary between the core and the cladding is viewed with a small video camera through very accurate optics. Image processing techniques can then measure the core offset of the two fibres and automatic stages again bring them in to alignment. An estimate (by viewing, not measuring) of the splice loss can be made after the fibres have been spliced. What is fixed alignment fusion splicing? Fixed Alignment Splicing Equipment is sometimes referred to as a cladding alignment splicer. As optical fibre is now manufactured to very high standards, the core is consistently central within the cladding (a low concentricity error). A cladding alignment splicer relies on the concentricity of the fibre core to achieve core alignment. Instead of using mechanical adjusters to align the fibres, fixed alignment machines use a precision ceramic V-block to provide cladding alignment. The fixed V-grooves align fibres to within 1 µm. As the arc fires the fibres become molten and are then pushed together. To overcome any misalignment problems a fixed alignment splicer uses a long arc time to allow the surface tension effect of the molten glass to bring the fibres into perfect alignment. Using a reciprocating technique called ‘wiggle’ can accelerate this process. In ribbon fibre between 4 and 16 primary coated fibres are laid side-by-side and sandwiched between two layers of tape. Various network suppliers around the world use ribbon fibre. 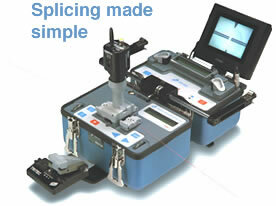 Hence, the ribbon splicer is a multifibre version of the fixed alignment splicer. There is a precision v-block with between 4 and 16 v-grooves providing cladding alignment. All fibres are spliced at once using an offset arc. Unique to the FASE II fusion splicer, the surface tension effect of molten fibre has been increased by the technique of axial reciprocation (wiggle) during the splicing process. After the molten fibres have been brought together, one of the fibres is wiggled in and out in a controlled fashion whilst still molten. The fibre is moved backwards and forwards around 5µm, 5 times per second. This increases the cladding alignment effect of the surface tension of the molten glass, producing a lower splice loss and a stronger joint. It also helps to diffuse dopants across the splice boundary improving core mismatch problems even further. As this reduces the length of time the arc has to be fired for, it also increases the number of splices you can make with a fully charged FASE II. How do the different types of splicer compare? For splicing single fibres, the big choice is between a fixed alignment splicing system and a core aligning system. Generally, fixed alignment splicers are less than half the price of three-axis splicers. As a fixed alignment splicer is far simpler in design (with no complex motorised stages), it is far smaller and tends to be more reliable than a three-axis machine. A fixed alignment machine is easier to use and as modern fibres consistently have the core in the centre, cladding alignment still produces low losses. Therefore, the requirement for core-alignment in a splicer is not always essential. Three-axis video alignment machines can provide an estimate of the splice loss but only for singlemode fibre, and are notoriously inaccurate. See our other FAQ sections: What is Optical Fibre? and What is Fusion Splicing?